African LCC group fastjet is aiming to finally pursue fleet expansion and launch affiliates in 2015. The group ends 2014 with a fleet of only three A319s – the same number of aircraft it operated at the end of 2012 and 2013 – after repeatedly delaying expansion and the launch of new affiliates. The Tanzania-based group could potentially triple its fleet in 2015 as a second affiliate is launched in Zambia and potentially a third base is also opened, most likely in Uganda. But such growth is far from a certainty and it seems unlikely the long anticipated launch of affiliates in Kenya and South Africa will occur in 2015.
fastjet has accumulated approximately USD200 million in losses since being established in 2012. It is confident lower oil prices and the suspension of unprofitable operations in Angola and Ghana will significantly improve its financial position in 2015. Protectionist hurdles - frequently of little practical value - remain and competition meanwhile is intensifying. The London-listed fastjet group currently consists of one airline, fastjet Tanzania, operating three A319s on three domestic and four international routes. fastjet Tanzania launched services in late 2012 with an initial fleet of three A319s. 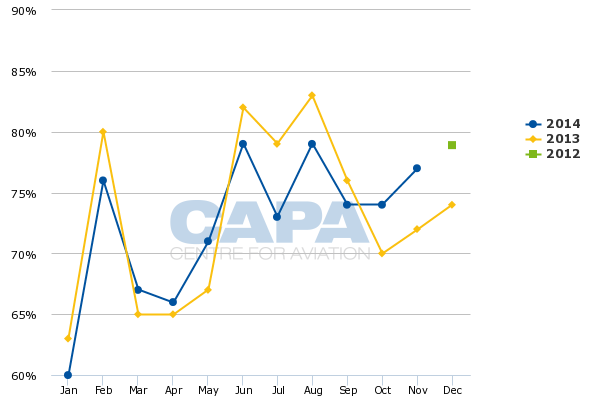 The airline has been able to expand in 2014, although on a very low base, by increasing aircraft utilisation rates. 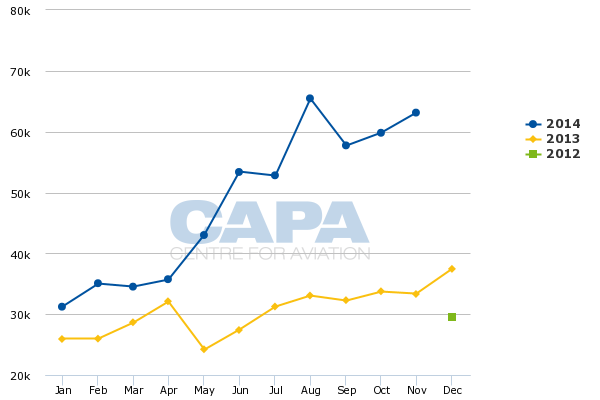 fastjet Tanzania passenger traffic was up 59% for the 12 months ending 30-Nov-2014, to 569,000. The increase in passenger numbers this year has been mainly driven by the launch of three new international routes from its Dar es Salaam base. fastjet began serving Lusaka in Zambia in Feb-2014, followed by Harare in Zimbabwe in Aug-2014 and Entebbe in Uganda in Sep-2014. Based on schedules for Jan-2015, Entebbe is served with four weekly flights while Harare, Lusaka and Johannesburg (which was launched in Oct-2013) are each served with three weekly flights. The LCC also has added domestic capacity and currently operates an average of seven domestic flights per day. This includes three daily flights from its Dar es Salaam base to Mwanza, between two to three daily flights to Kilimanjaro and between one to two daily flights to Mbeya. Higher load factors have been another driver in the increase in passenger numbers. fastjet Tanzania’s load factor improved by 5ppts from 72% in the 12 months ending Nov-2013 to 77% in the 12 months ending Nov-2014. fastjet Tanzania also has been able to reduce unit costs as it has nearly doubled its average aircraft utilisation rate, which in the first year of operations was extremely low for an LCC at less than six hours per day. But the group has remained highly unprofitable. For the six months ending 30-Jun-2014, the last period the group reported financial results, fastjet incurred a group operating loss before exceptional items of USD31 million compared to USD25 million in 1H2013 (see Background Information below). The group has accumulated operating losses of USD166 million over the last three years (Jul-2011 to Jun-2014) while generating revenues of only USD97 million. About three-quarters of these losses and half the revenues were generated by fly540-branded operations, which fastjet acquired in attempt to accelerate its entrance into several African markets. fly540 Tanzania, which had been the smallest of the fly540 franchises, was quickly converted into an LCC and rebranded fastjet Tanzania. But the group ultimately determined that fly540 Kenya could not be converted into an LCC and that the Angola and Ghana markets were not ready for the LCC model. fastjet disposed of fly540 Kenya in Jun-2014 while fly540 Angola suspended operations in Feb-2014 and fly540 Ghana stopped operating in May-2014. The sale and suspension of the various fly540 affiliates, which were all following a regional airline rather than LCC model, significantly improves the fastjet outlook in 2015. The group can now focus on expanding its footprint throughout Africa by launching new affiliates from scratch, which should ensure future operations have the LCC DNA needed to be viable. The initial strategy of buying existing airlines seemed logical at the time, mainly aimed at overcoming the burdensome regulatory protectionism confronting start-ups in most African countries; however, in this case it proved too challenging and very costly. The losses are clearly unsustainable given the airline only generated USD47 million in revenues through its first 19 months of operations. This includes USD2 million in Dec-2012, USD26 million in 2013 and USD19 million in 1H2014. The group is confident fastjet Tanzania can become profitable in 2015, boosted by lower fuel prices as it does not have any fuel hedges. But given the extent of the losses so far – including an operating margin of about negative 74% in 1H2014 – it will take a lot more than lower fuel costs to turn the LCC around. Scale is clearly an issue. fastjet Tanzania is about to carry its one millionth passenger – a milestone most LCCs meet in a much quicker timeframe than the 25 months taken by fastjet. The Tanzanian market is relatively small and is not expected by fastjet to support an LCC operation of more than seven aircraft over the medium to long term. Even with its current three aircraft schedule fastjet is already the largest airline in the Tanzanian market with an approximately 20% share of total seat capacity. fastjet’s model has always envisioned achieving economies of scale by establishing a group of airlines. This would unlock synergies through joint purchasing, sharing a website and connecting the dots by serving common destinations. But fastjet has so far faced repeated delays in launching new affiliates, making it impossible to achieve the scale needed to be profitable. Initially the group focused on launching affiliates in South Africa, Kenya and Nigeria. MoUs with joint venture partners in each of these markets were initially signed in 2012 and early 2013. The group’s initial fleet plan envisioned 13 aircraft spread across multiple bases by the end of 2013. After encountering numerous setbacks in the main markets of Nigeria, Kenya and South Africa, fastjet decided in early 2014 to pursue an affiliate in Zambia as its first priority. As CAPA previously outlined, this was a sensible decision because while Zambia is small, it is a relatively under-served and less competitive market with fewer barriers to entry. The group was initially aiming to launch fastjet Zambia in mid-2014. After the initial target date was missed it remained optimistic it would still begin operations by the end of 2014. In late Jun-2014 fastjet unveiled a four-year fleet plan which included two A319s for fastjet Zambia by the end of 2014.
fastjet CEO Ed Winter told CAPA on 23-Dec-2014 that the restructuring of the Zambia Department of Civil Aviation has delayed the process of securing an air operator’s certificate (AOC). But Mr Winter is optimistic the airline will be able to secure an AOC and launch in 2015. A revised four-year fleet plan, unveiled in late Sep-2014, included three A319s for fastjet Zambia in 2015 as well as four additional aircraft for Tanzania, two for Zimbabwe and one for Kenya. South Africa, which in the June-2014 version of the fleet plan was allocated three aircraft in 2015, was not included in this latest plan until 2016.
fastjet, however, has already taken a step back from this plan. Mr Winter advised that the group is now taking a flexible approach to its fleet plan for 2015 and beyond. The number of aircraft the group will add in 2015 hinges on how plans and approvals for new bases progress. Mr Winter said the fleet potentially could triple in size, which would suggest nine aircraft by the end of 2015 – still fewer than the up to 13 aircraft earlier envisioned. fastjet plans to stick with A319s as it resumes fleet expansion but has not yet completed any deals for additional aircraft. The group is currently talking to several leasing companies and should not have any issues securing additional aircraft when it is finally ready to expand as there are plenty of second hand A319s currently available. fastjet recently took delivery of a 10-year-old ex-South African Airways A319 from ICBC but this has been used to replace an older 15-year-old A319, which has been returned. The ICBC A319 is powered by V2500s and is currently in two-class 120-seat configuration while the group’s other two A319s are powered by CFM56s and are in single-class 145-seat configuration. But fastjet plans to reconfigure the recently delivered A319 in early 2015 to its normal 145-seat single-class configuration. This aircraft will also likely be moved to fastjet Zambia in 2015 as the Zambia fleet focuses on V2500s while fastjet Tanzania receives additional CFM56-powered A319s. The flexible approach to fleet expansion is sensible as it is difficult to predict how fast (or slow) approvals can take to secure in the bureaucratic context of the African regulatory environment. Market conditions and the competitive landscape can also change rapidly. For example in South Africa fastjet is now closely monitoring the progress of South Africa’s other two LCC start-ups, FlySafair and Skywise. FlySafair launched in Oct-2014 while Skywise is now aiming to launch services in early 2015. fastjet still sees South Africa as a critical market in its long-term strategy but will be cautious with its timing. South Africa would be completely a domestic play as fastjet has better odds at serving South Africa’s international market by using its other affiliates. South Africa’s traffic rights in most short-haul markets are all used up by South African Airways (SAA), and to a lesser extent British Airways franchise partner Comair, while there are generally unused rights on the other side. While fastjet remains interested in South Africa’s domestic market, rapid expansion by FlySafair and Skywise could make it difficult to enter. Another challenge fastjet continues to face is securing traffic rights. Even once an AOC is secured in a particular country it can take months or years to get the desired traffic rights. For fastjet Zambia, South Africa is the main target market. fastjet is confident it can secure traffic rights for Lusaka-Johannesburg, a large market now dominated by South African Airways with four daily flights, as there are currently no Zambian carriers on the route. But South Africa can be notoriously slow and difficult in approving any new foreign carrier from operating into South Africa. fastjet found this out the hard way in 2013 when South African approvals for its Tanzanian subsidiary dragged on for months, leading to repeated delays in launching Dar es Salaam-Johannesburg. fastjet believes future applications to South Africa will be processed faster as South African authorities are now familiar with the group. 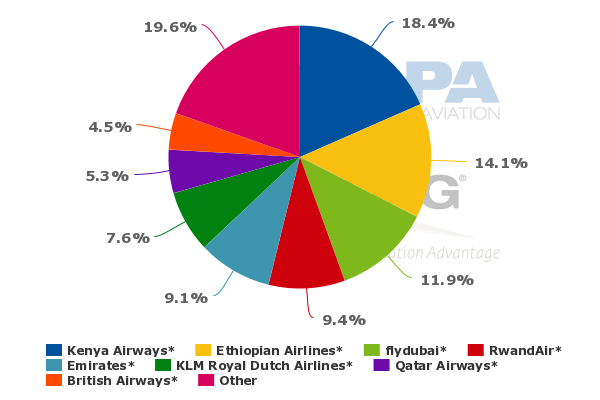 But the fact remains that South Africa can be tempted to protect flag carrier SAA, which relies on very high yielding regional routes to offset losses elsewhere, despite the obvious consumer benefits to opening up the international market to LCCs. Kenyan authorities have appeared to be even colder to the prospect of new LCC competition. fastjet Tanzania has still not been able to secure Kenyan approvals to serve Dar es Salaam-Nairobi, a large market now only served by Kenya Airways with four daily flights. fastjet Tanzania also has applied for three other Tanzania-Kenya routes – Dar es Salaam-Mombasa, Kilimanjaro-Nairobi and Zanzibar-Nairobi – as well as fifth freedom rights for Entebbe-Nairobi. Meanwhile, the process of launching fastjet Kenya also has encountered frustrating delays. fastjet Kenya’s application for an Air Service Licence (ASL) has been repeatedly deferred by Kenyan authorities since it was submitted in Aug-2014. fastjet continues to answer questions from Kenyan authorities but it is impossible to predict when a decision will made on the ASL, which is needed for the AOC process to begin. Access to Kenya, one of the largest markets in Africa, is essential. Even if fastjet is not able to launch a Kenyan carrier and enter Kenya’s domestic market, Nairobi is a key destination for its other bases. Kenyan authorities will hopefully start to recognise the potential positive impact that more LCCs would bring to the economy, particularly the tourism sector, and adopt a more liberal policy. Kenyan authorities could potentially be waiting for Kenya Airways' budget subsidiary Jambojet to develop further. Jambojet launched in Apr-2014 and currently only operates in Kenya’s domestic market. All the delays in securing new traffic rights and AOCs are costly as competition on several of the routes targeted by fastjet is intensifying. For example, the Lusaka-Johannesburg route will likely no longer be an SAA monopoly by the time fastjet Zambia is awarded its AOC and secures all the required approvals from the South African side. RwandAir recently unveiled plans to launch Lusaka-Johannesburg in early 2015 using newly secured fifth freedom rights. New LCC group flyafrica.com is also planning to launch services on 9-Mar-2015 between Lusaka and Johannesburg, also using fifth freedom rights. fastjet launched operations nearly two years prior to flyafrica but has not been able to leverage its first mover advantage due to all the delays in establishing new joint ventures. fastjet now risks becoming the second LCC on several routes including Lusaka-Johannesburg and Harare-Johannesburg. Zimbabwe is likely to emerge as an initial battleground between fastjet and flyafrica.com as fastjet is now looking at establishing a Zimbabwean affiliate in 2015. The decision to pursue an affiliate in Zimbabwe, which was not part of the original fastjet business plan, seems like a strategic move in response to flyafrica. As Zimbabwe is a relatively small market – similar in size to neighbouring Zambia – it may not be able to support two home-grown LCCs over the long term. Mr Winter believes the Zimbabwe-South Africa market is large enough to support another new entrant and points out there are still unused traffic rights on the Zimbabwean side. Harare-Johannesburg is a large market ripe for LCC stimulation as there is a high volume of ethnic and migrant worker traffic which has traditionally travelled by bus. SAA currently serves Harare-Johannesburg with five daily flights while South Africa’s Comair, Air Zimbabwe and flyafrica.com each operate one daily flight, according to OAG data. fastjet Zimbabwe could also potentially compete with flyafrica.com, SAA and Comair on the Victoria Falls-Johannesburg route. But as fastjet also plans to have an affiliate in Zambia it could instead opt to compete against SAA and Comair on the Livingstone-Johannesburg route. Livingstone is on the Zambian side of Victoria Falls and is only about 30km from Victoria Falls Airport. fastjet plans to focus its Zambian operation on the capital Lusaka with domestic services to Ndola along with international services to Johannesburg, Lilongwe and Nairobi. But fastjet plans to consider some services at Livingstone, which is primarily a leisure market. Zimbabwe is now one of six target markets for fastjet along with Tanzania, Kenya, South Africa, Uganda and Zambia. The aim is eventually to establish affiliates in all these markets except Uganda, where fastjet envisions opening a base but using its Tanzanian certificate. Uganda has one of Africa’s most liberal aviation policies and is keen to attract fifth freedom services to fill the void left by flag carrier Air Uganda, which suspended services in Jul-2014. fastjet announced in Nov-2014 that it had secured fifth freedom rights from Uganda for the Entebbe to Juba, Kigali, Nairobi and Johannesburg routes. The group does not believe it can support all the planned fifth freedom routes from Uganda by flowing through aircraft from Tanzania as the Dar es Salaam-Entebbe route is not likely to support more than one daily flight. A small base is therefore envisioned in Entebbe using fastjet Tanzania aircraft. This would create a de facto fastjet Uganda without a Ugandan AOC. fastjet could however run into challenges securing approvals from Kenya and South Africa for the planned Entebbe-Nairobi and Entebbe-Johannesburg routes. RwandAir also secured fifth freedom rights from Uganda earlier this year for Entebbe-Nairobi but have been prevented from operating by Kenyan authorities. Kenya Airways is currently the largest airline in the Uganda market with about an 18% share of seat capacity. South Africa is also generally not receptive to fifth freedom applications and is likely to be keen to keep Johannesburg-Entebbe as a monopoly route for SAA, particularly as SAA faces the prospect of new LCC competition in other regional international markets. Entebbe-Kigali and Entebbe-Juba are relatively small markets that may not be able to support another new competitor. RwandAir and Ethiopian both recently launched Entebbe-Juba using newly awarded fifth freedom rights. RwandAir also now competes on the Entebbe-Kigali market with flydubai, which recently secured fifth freedom pick up rights from Uganda and Rwanda for the local sector of its Dubai-Entebbe-Kigali route. Kigali and Juba may also be too small to sustain services from more than one fastjet base. Generally fastjet is looking for destinations that can support services from multiple bases. This is a typical strategy for a regional LCC group as connecting the dots provides for better economy of scales and synergies as stations can be shared. For example fastjet envisions Lilongwe in Malawi as a destination from both Dar es Salaam and Lusaka, with both routes potentially launching in 2015. Johannesburg and Nairobi would be able to support several fastjet routes even if the group does not succeed at launching local affiliates in South Africa and Kenya. 2015 will be a critical year for fastjet. After a slow initial two years, the group should finally be able to launch a second affiliate and expand its fleet beyond three aircraft. But once again there will be challenges to overcome, including continued regulatory resistance in some markets and, increasingly as time passes, new LCC competition. fastjet has been a pioneer in establishing the LCC model in East Africa. It has successfully stimulated demand by bringing the first taste of low fares to consumers in markets that traditionally have had some of highest average fares in the world. fastjet however has struggled financially and has had numerous regulatory setbacks. It has been unable to expand rapidly and therefore has not been able to exploit its first mover advantage. Other African LCCs will inevitably benefit from fastjet’s groundbreaking work and could end up pursuing faster expansion, overtaking the pioneer.